Lakeshore Players Theatre just opened their shiny new theater space in White Bear Lake this spring, and now they're starting a new "Kids and Family Series." To be honest, this isn't something I'd normally be interested in; I don't have children and haven't worked with children in over 20 years. But the cast of their first production, Elephant and Piggie's "We Are In a Play! ", is one I couldn't pass up. My super talented cousin is making her #TCTheater debut, so of course I had to see it! In addition to her fantastic performance, I found the one-hour musical to be delightfully clever, and the kids in the audience were completely enraptured. It's never too early to introduce the little people in your life to theater, and this show is a great start. But note there are only a handful more performances and seating is limited in the intimate black box space, so make your plans soon (click here for info and tickets). I was not previously familiar with the Elephant and Piggie series, but when I told my sister (a special ed teacher) she was very excited, so apparently it's quite popular among kids and adults alike. 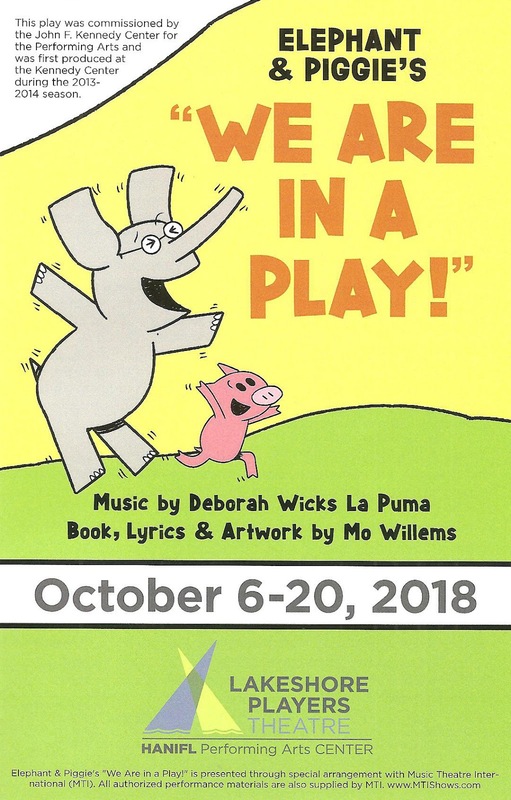 The author of the series, Mo Willems, has adapted his work into a musical (with composer Debora Wicks La Puma). Best friends Piggie and Elephant Gerald (side note: is it intentional that this sounds like Ella Fitzgerald if you say it fast?) go through a series of adventures (parties, sharing, broken toys) as they do in the books, learning lessons about friendship along the way. In some clever fourth wall breaking, they eventually realize that people are watching them and that they are in a play! Which allows for some fun audience interaction, a clever way to directly engage the kids (and grown-ups!). Under director Jeff Anderson, everyone in the five-person cast is enthusiastic and playful, including Nate Brown and Emma Larson as Elephant and Piggie, respectively, and Anna Werner, Greta Eherenman, and Thalia Kostman as their friends the Squirelles, a sort of doo-wopping harmony-singing Greek chorus (think Little Shop of Horrors). They all sing (to a recorded track, sadly) and dance (choreography by Kirsten Nelson) their way through this joyful show. Half the fun of seeing this show is watching the kids in the audience. They're so open, engaged, and responsive, not having yet learned the proper Minnesota audience reservedness. In this intimate space with a thrust stage, and cast exiting and entering through the audience, there's no distance between audience and performers. It's a whole lot of fun for everyone. 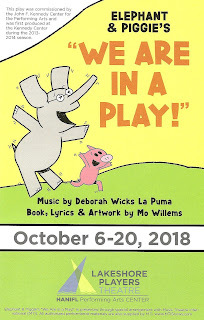 Elephant and Piggie's "We Are In a Play!" continues through October 20 at the Hanifl Performing Arts Center in White Bear Lake.